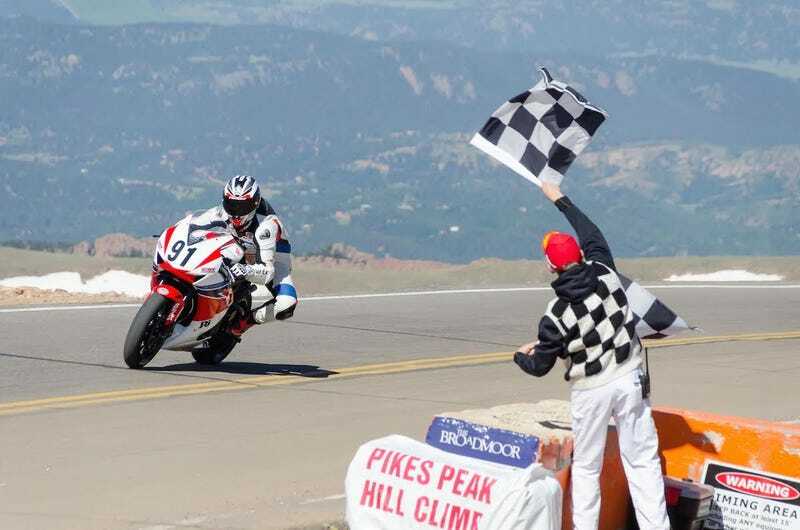 The Pikes Peak International Hill Climb (PPIHC) is easily the most batshit insane motorcycle race in the United States. The 12.42-mile long course is where the fastest and craziest among us go to compete against both fellow man and mountain as they ride to the top of the 14,110 foot summit. But this year, many of them won’t be allowed to compete. I wasn’t being hyperbolic when I said the Pikes Peak race was bananas. A motorcyclist has died each of the last two years during the weekend-long event, with Bobby Goodin crashing as he entered the dirt lot after crossing the finish line in 2014 and Carl Sorensen crashing and flying off a cliff last year. Guess what they had in common? They were both riding sportbikes, with Bobby on a Triumph Dayton 675R and Carl on a Ducati 848. If having two deaths in two years doesn’t seem like much of a pattern, keep in mind that people have only been riding sportbikes on the course for the past five years. Before that, the course wasn’t fully paved and sportbikes, with their clip ons and lack of steering lock, weren’t advantageous to ride. But, in 2011, they paved the last sections and changed a previous rule that didn’t allow bikes with clip ons, and average times started to drop dramatically. For 2015, Honda’s Jeff Tigert took top honors in the motorcycle class on a Honda CBR1000RR and the year prior, 2014, Jeremy Toye won on a Kawasaki ZX-10R. The PPIHC motorcycle program is faced with many challenge considering what has happened over the past two years with fatalities and injuries. To be honest, there was a lot of talk on the insurance side as well as from the BOD [Board of Directors] about eliminating the motorcycle program completely from PPIHC. Although we understand that PPIHC is inherently dangerous and deaths and injury may occur regardless of what type of bike someone is riding, the decision to make it mandatory to have one-piece handlebars was made based upon the type of bike the committee and BOD is comfortable allowing to race Pikes Peak. Once the Committee and BOD determined to keep the motorcycle program in place, changes regarding the bike program had to be made. One common factor in both fatalities was the type of bike both competitors were riding and the BOD is no longer comfortable allowing that type of bike on Pikes Peak. They then reached out to Tigert and Toye to get their thoughts. It will be interesting to see if this rule change has an effect on the safety results of the race, especially considering that the race record was set on a Ducati Multistrada by Carlin Dunne with a time of 9:52:819 the first year the course was fully paved.